Dandenong quick James Wilcock admits that if he hadn’t stepped away from the rigours of Premier Cricket for a couple of years, he may have given it away completely. With 135 first XI wickets for the Panthers after debuting at just 16 in the 2008/09 season, the now 26 year-old is a relative veteran of Premier Cricket, but chose to step away and return to his home club, Berwick, after snaring 27 wickets in 2015/16 for one simple reason. “I was burnt out of cricket, really – playing Premier Cricket takes some time out of your life, and I played various junior tournaments and went to England for three years when I was young, and I got sick of it,” he said. 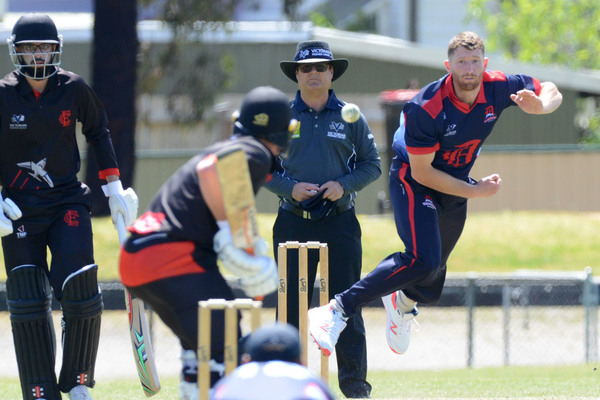 Clearly above the Dandenong District’s Turf 1 grade, netting 59 wickets at 13.35 in two seasons down at Berwick, Wilcock made the choice to return to Shepley Oval after the Panthers’ stunning premierships last year. “I had a pretty good season at Berwick, and got myself really fit, and I thought I’d give it another crack,” he said. Through injuries and availability, the former Victorian Under 17 and Under 19 representative has been thrust straight back into the thick of the action, taking the new ball for the Panthers to lead the attack, and described the “cut-throat” nature of Premier Cricket, something he is once again thriving off. “It’s been pretty smooth (coming back to Dandenong), it does help that most of the guys around Dandenong are virtually the same, so that does help quite a lot,” he said. “It’s a different level of cricket, so it’s taken a bit of time on the cricket side of it – it’s just that bit better and getting use to bowling to better batsmen. “If you miss a training session or two, you feel a bit guilty, because there is guys in the twos that want to take your place – even me, you feel like you’ve been going well and guys like Peter Siddle and James Pattinson come back in and you quickly find yourself in the twos. Wilcock has started to find his groove, snaring 5/28 in a brilliant effort against Northcote, and also took 3/45 against Essendon the week prior. “I love it (leading the bowling attack) – it’s not something I really expected, but those injuries have given me a bit of opportunity, and I just have to make the most of it,” he said. And as for the reigning premiers – who are moving along steadily in their premiership defence – Wilcock said that things are bound to click very soon. “That’s why you play sport, to win – they won last year, but it’s always harder to back it up – we’ve started the season alright, and there are probably a few things we could fix, but it’s enjoyable,” he said.